Level up your skills. Lead your team. Our Advanced Social Media Strategy Certificate is a comprehensive and academically recognized certification by Hootsuite and Syracuse University’s S.I. Newhouse School of Public Communications for leaders who want to step up their strategy and get results with social media. Confidently contribute to your organization’s social media strategy with frameworks used by some of the world's most effective social media teams. Master advanced skills including content strategy, influencer marketing, and accurate ROI tracking. Learn proven strategies from leading industry and academic experts. The ASMS is for managers, strategists, and leaders who want to gain a comprehensive understanding of how to build and scale social media in complex organizations. With the ASMS, you’ll earn your academically recognized certification taught by industry experts and designed to advance your career. The program was created by Syracuse University’s renowned S.I. Newhouse School of Public Communications in partnership with Hootsuite. You'll gain indispensable tools and advanced methodologies used by the world's best social brands. Our alumni include leaders at brands such as Procter & Gamble, Safeway, Pfizer, Legg Mason, University of New Hampshire, and SAIT Polytechnic. Syracuse University's Newhouse School is one of the top communication schools in the world, preparing students to become leaders in a changing media landscape. Our alumni go on to own their organization’s social strategy and lead high-impact teams. Use social media to support core business goals, breaking down internal barriers and scaling initiatives across your global teams. Build core skills to help you plan, launch, and measure complex social media campaigns at enterprise organizations. Sharpen your strategy skills and learn new frameworks used by high impact teams. Successful strategies begin by asking the right questions. From understanding your competitor landscape to audience segmentation, you’ll gain an overview of how to build an integrated strategy in complex organizations. Master the strategic elements—polices, crisis response plans, KPIs, and training—that need to be built into your strategy. You’ll also learn how to confidently set social media objectives with the GOST framework. Whether you work at a niche B2B company or popular consumer brand, social listening is key to winning customers on social channels. Learn how to build efficient processes for finding and acting on customer, competitor, and industry conversations. Influencer marketing is an essential part of winning trust and increasing sales from social channels. This lesson teaches you how how to analyze social influence and shows you best practices for influencer engagement. Content—it’s the fuel of any social strategy. In this lesson, you’ll gain a comprehensive playbook of how to create, curate, and distribute social media content. CMOs need to understand the revenue impact of social channels. Learn how to properly track ROI and confidently answer hard questions from executives about the value of social media. We review everything you’ve learned. We’ll also walk you through an illustrative example that shows you how to build a complete social strategy. Your organization expects you to know what’s next in social. Discover how to plan for future trends and learn new tools to analyze opportunities in social. The ASMS Certificate has helped me become a more well-rounded communications practitioner. I'm no longer talking from a theoretical point of view, but with hard facts supporting my recommendations. Today, we're building out integrated plans that include social media strategy, so that colleagues have time to review, add input, and feel confident that our efforts are within regulations and results-oriented. 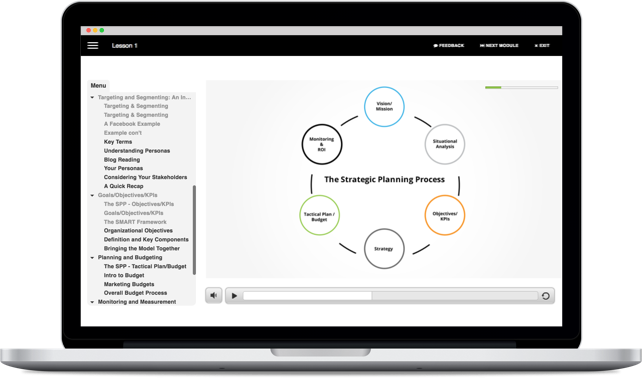 ASMS helped me better understand how to strategically fit social into the strategic planning process. A social media strategy presents us with a guide on how to modernize and personalize the CMA. Using ASMS as a blueprint, we did an audit of our social channels, determined our maturity, and established a social media strategy that included employee advocacy and social campaigns. Having the listening tools and knowledge is key to socially securing the brand. Our compliance department is more comfortable with the medium now that protocol, standards, and guidelines are established. 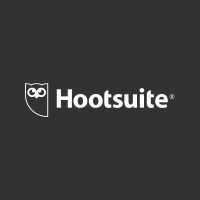 Hootsuite and Syracuse University are both renowned in their industries. With this higher education, I am confident that I can grow from manager to director of social media as I bring that much more to the table. I found the case studies particularly helpful. In the B2B space, I'm not necessarily thinking of how other businesses are marketing to customers, but they made me think outside of the box; that knowledge adds value to my partnerships across Bell. The course is a one-time fee of $999 USD. Need to train your team? Email us for group discounts. The course includes video lessons, interactive text-based learning, supplemental readings, quizzes, and a qualifying exam. You can view the course content at any time and can work at your own pace. The ASMS certificate consists of eight lessons with an average completion time of five hours per lesson. It takes around 40 hours from start to certification. Is there homework to complete? There is no homework and no assignments with the course. You will be evaluated through the final exam. However, we recommend that all students read all supplemental material provided in the course. Does this certificate count towards a degree or other postsecondary accreditation? The ASMS certificate is accredited by Syracuse University’s S.I. Newhouse School of Public Communications. This is an accredited course. But the certificate cannot be used as regular course credit at Syracuse University’s S.I. Newhouse School of Public Communications. How will taking this course benefit my career? Many of our students use this training to step up and own their organization’s social strategy. Our alumni include leaders at brands such as Procter & Gamble, Safeway, Pfizer, Legg Mason, University of New Hampshire, and SAIT Polytechnic. To earn your certificate, you need to pass the final exam with a score of 75% or higher. You’ll take a multiple choice exam. The exam is delivered online and takes 90 minutes to complete. If you fail the exam, you can study further and retake as many times as you need to pass. Are there any physical classes or seminars to attend for this certificate? No, the course is delivered online and can be completed at your own pace. You have guaranteed access to the course materials for a year after purchase. Can I download the course materials? You may download the supplemental resources included in the resource folder for the course. All other content is only available within the ASMS learning platform. How difficult is the course material? The course is designed for experienced practitioners interested in developing the strategy skills they need to lead at enterprise organizations. Students should have a knowledge of marketing fundamentals before taking this course. This course is open to everyone. You do not need to be a student at Syracuse University’s S.I. Newhouse School of Public Communications to enroll. Do I get a digital or printed certificate? Successful graduates will receive a digital certificate. Your certificate can be posted on LinkedIn as a certification or qualification.